It’s now been almost a full month for Ruskin Readers without the vital support of the librarians and space which is Carnegie Library. This is how things now stand. As you know, we’re currently housed in The Cambria for our Monday evening sessions. One of the problems of a literacy club sharing space with pub punters reared its head recently. 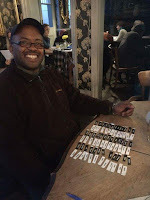 The pub had scheduled a charity quiz night which cut across the timings we’d arranged for Ruskin Readers. Teaching reading and writing amidst crowd buzz, clinking glasses, loud music, kitchen sounds and an MC was nigh on impossible. I can’t blame the pub for this cross-over. It is after all… a pub. One of our main problems continues to be access to our valuable resources. 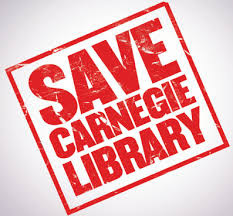 After a lengthy talk with Jim Dickson last week, Caroline Knapp is still no further along with securing us a better interim venue or the reopening of Carnegie. 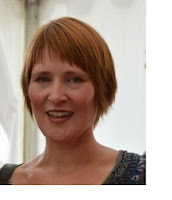 Cole Beauchamp was longlisted for the Fish Short Story Prize & the Mslexia Novel competition in one magical year (2013), and has been beavering away on her novel since then. She lives in London with her girlfriend and their two children. Cole is represented by Juliet Mushens. One of my favourite writers, Jhumpa Lahiri, decided to stop writing in English and switch to Italian in 2012. She’s just written (in Italian) her memoir, “In Other Words” – which she had Ann Goldstein translate into English – to describe this experience. Born to Indian parents who immigrated to the US, Lahiri won the Pulitzer with her first collection of short stories, “Interpreter of Maladies”. She found fame after her first book disconcerting: “All of my writing comes from a place where I feel invisible…But a year after my first book was published, I lost my anonymity.” Her answer has been a linguistic exile in Italy. I find this idea of escaping to a foreign tongue so fascinating. Ruskin Readers had its first session at The Cambria on Monday. Without the books for loan in Carnegie library, our laptops, student folders and exercise books - we had to improvise. And improvise we did. Many tutors bought workbooks for their students, created resources in their own time and downloaded worksheets. Lead tutor, Caroline Knapp, brought along a selection of Michael Morpurgo books as well as a pile of free newspapers for the reading section of the evening. Currently our Monday evening group are kindly being rehoused by The Cambria. They reserved several great tables for us and we were able to avail ourselves of tea, coffee and juice from the bar. One of our generous tutors paid the bar bill. The #carnegieoccupation has been ongoing for 7 days now. And it’s trending in 19th place on Twitter. Don’t think Lambeth was expecting that. On Monday evening Ruskin Readers went along to the library at our usual time to see if security would let us in to the building to do the vital adult literacy work we’ve been doing for the last 40 years. Unsurprisingly, we were denied entry. 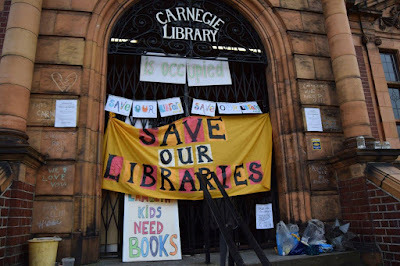 Our stock of books, laptops and folders are trapped in the library and we cannot gain access to any of them (all locks in the building were changed by Lambeth before the planned closure on 31st March). Once we do gain access to all of this we will then have to mull over the problem of where to store 2 cupboard’s worth of necessaries. After joining in the vigil on the steps of the library, interviews by London Live and photo opportunities, students and tutors headed to the Cambria Pub for a pow wow. 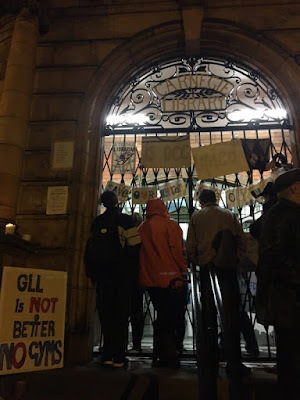 We’ve still had very little response from Lambeth on where we will be housed during our eviction. So, Lambeth Council have gone ahead with their plan to shut Carnegie library so they can turn it into a gym. But they weren’t counting on members of the community fighting back in a style of protest Mahatma Gandhi would be proud of. Approximately 30 people, including two babies and several teenagers are occupying the library as of this moment. They have been doing so since Thursday evening with the support of the community. Several Labour councillors have hit back with very personal and cavalier comments about the occupiers. The most inappropriate of these being the cat tweets by the councillor Alex Bigham. You can see his full twitter response on Brixton Buzz.